Peach State Roofing often assists many property managers and building owners with yearly roof maintenance plans around the country. It is good building facilities practice to regularly keep up with items on a building’s roof that can lead to larger problems or shorten the life of a roof system down the road. Below are five simple areas that Peach State Roofing recommends and looks into when on roof systems for basic roof maintenance. 1. Clean out gutters and drain areas – Regular inspection of drains and gutter areas is a necessity. Foliage and debris can easily build up in these areas causing water to back up into a building causing leaks and can even damage a building roof plumbing system or hanging gutter areas. A good rule of thumb to follow is to check twice per year, especially after fall time when leaves can build up on roof areas. 2. Exposed caulking areas should be touched up – Over time, areas such as termination bar, counter flashing, pipe clamps, etc. that have caulking/sealant applied to seal edges, will become brittle and worn away from the elements. Sometimes the slightest cracking or pulling away of caulk can lead to minor leaks. Peach State Roofing always recommends inspecting exposed caulking areas and touching up if needed. Typically a polyurethane caulking is used such as NP1 made by BASF. 3. Trash and debris kept clear from roof – Often time other trades that have access to the roof will leave materials, trash, or tools left behind on the roof which can cause only further damage to the roof. Other trades need to be very cautious as to not allowing used screws and such to puncture through the roof or worse. A majority of leak service calls received can be attributed to other trades causing damage to the roof. Keep the roof clean of all things that should not stay up there permanently. 4. Top off pitch pockets/pans – Pitch pockets/pans will face the same consequences as exposed caulking and be susceptible to cracking/voids over time. Its good practice to inspect these areas regularly and if needed, re-top them off with new pour-able sealant or coating to protect these areas from further UV deterioration. Pitch pockets/pans are a common area for leaks. 5. Clean grease trap areas – Not all buildings have grease vents that ‘spit’ grease onto the roof but if a building does, this is a main area of attention that should be regularly cleaned and inspected. Grease can cause major issues to roofs over time. Mostly stand alone restaurants and retail properties have grease vents on their roofs. 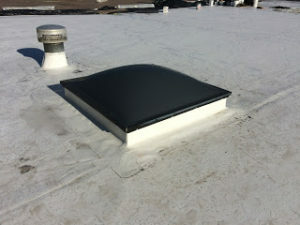 Good maintenance practices are to have the vents, roofs, and grease traps cleaned regularly and always make sure a sacrificial sheet of membrane is installed around these areas as well.